Rivers Unlimited was founded in 1972 to work for the restoration and protection of Ohio's rivers and streams. It is the nation’s oldest statewide river conservation group. It’s founders and like-minded conservationists founded River Network, the national umbrella organization. For forty-two years, RU has worked with citizens to cultivate grassroots stewardship of their waterways. The founding board members convened originally in response to a national wave of dam-building and channel-straightening projects which threatened numerous Ohio streams. Locally, RU had a hand in forging a compromise agreement which left the mainstem of the Little Miami River free-flowing, with flood control provided by dams on two of the three main tributaries - Caesar Creek and the East Fork of the Little Miami. The lakes behind these dams now are the focal points of state parks named for the tributaries. In the early days, the nascent Ohio Scenic Rivers Program and the National Wild and Scenic Rivers Program were gathering steam, and RU played a key role in bringing the first Ohio river – the Little Miami – designations in both the state and national programs. Ohio has the oldest scenic river designation program in the nation. It predates even the federal program. The Little Miami River was the first river designated in the program. 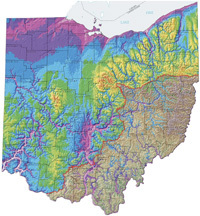 RU has continued to be a principal advocate for Ohio’s program, defending it against budget cuts, raising money to augment its funding, and working to bring designation to more rivers.